Making an Rpresentation in Rstudio with knitr I have a slide with just one picture, which I want to fill out the whole screen/slide. How do I do that? This is what I mean when I write that the picture does not "fill the whole screen", the red lines are drawn at parts of the screen which are not filled by the plot. Here's the way to set the overall presentation size: http://www.rstudio.com/ide/docs/presentations/displaying_and_distributing_presentations The default is quite small: 960 * 700.
and then you can use that in your code. knitr does recognise the custom css file, but it does not create an output according to my css settings. I know this because When I deliberately misspell the css file, knitr produces an error during output. 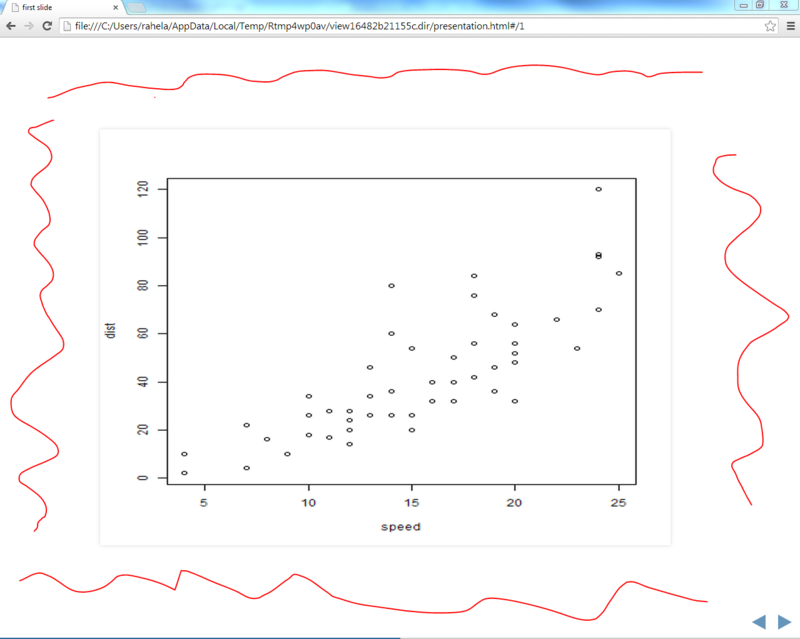 Considering Andy's response, I restrained my output to 940px wide and obtained good results for both the RStudio fullscreen presentation and "View in Browser"
If you use something like 1920 wide you will have issues when exporting to html or viewing in browser. Not the answer you're looking for? Browse other questions tagged r markdown knitr rstudio presentation or ask your own question. How to add a full-screen background image in Rpres (R Presentation) slides? How to make an image fill the entire slide in an rmarkdown presentation using ioslides? How to Make RStudio Presentation Self-contained?